Has anyone seen the reviews of the new Silicon Motion SM2262EN controller? The early benchmarks are very promising. The random performance looks promising. Nothing short of Optane and maybe Samsung Z-NAND is a competitor. It does have its weak points, but shows some promise. At least we have a marketplace that is not totally dominated right now by 1 company. Seen the same reviews you have. I'm not blown away, but it looks like SMI will have a very competitive controller on its hands, and more competition is always a good thing! The bigger question is who's going to use it. There's definitely room for more players to get serious about SSDs, but with Samsung, Intel, Toshiba, etc. dominating, it's hard to see a lot of room left for the smaller brands to play. It's just too expensive if you can't be buying in volume. Intel's already using the Silicon Motion SM2263 in the 660p and the SM2262 in the 760p... that doesn't mean they would use the SM2262EN, but at least they're already a SMI customer? As per my knowledge it supports DDR3, DDR3L, LPDDR3, and DDR4. It has a 32-bit/16-bit data bus and support for two chip enable pins, so there are plenty of options for the manufacturer to choose from when putting together their own design. ADATA, HP, and Mushkin all use the SM2262 controller. There are some pretty decent products out there. Here for example is the 2TB Mushkin with the SM2262 controller. For the price, it's not bad for a 2TB SSD. 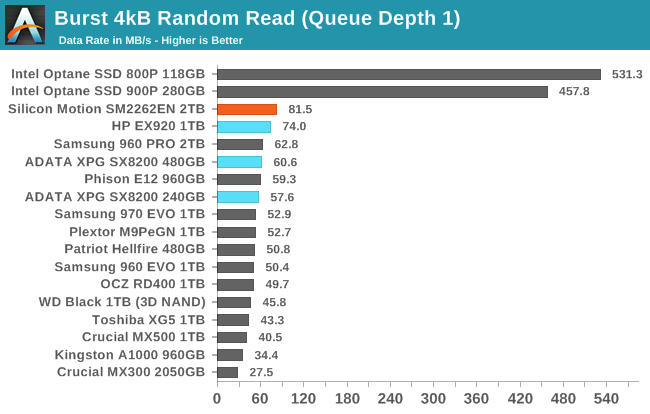 I suppose it would compete in the bracket occupied by SSDs like the Samsung 970 Evo, although just somewhat slower. The random performance is looking good though. They're definitely making progress, no doubt. It's just hard going up against the vertically integrated solutions from a cost and performance standpoint.